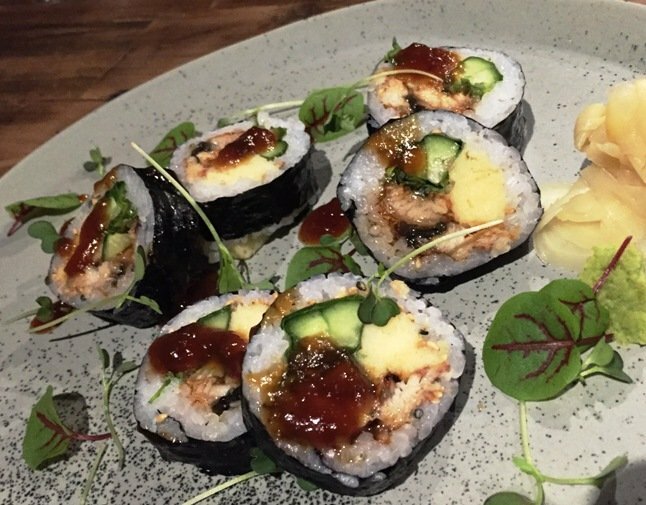 First Take: M Sushi in Durham For Fresh & Simply Delicious Sushi! 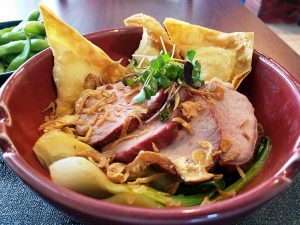 As a long-time fan of Sono and Chef Mike Lee in downtown Raleigh, I’ve had the chance to enjoy his food across many visits to his restaurant, Competition Cooking and even a pop-up dinner. But over the years like many long-time favorites, you sort of forget about them. Especially when I’m usually chasing down new restaurants in the Triangle. 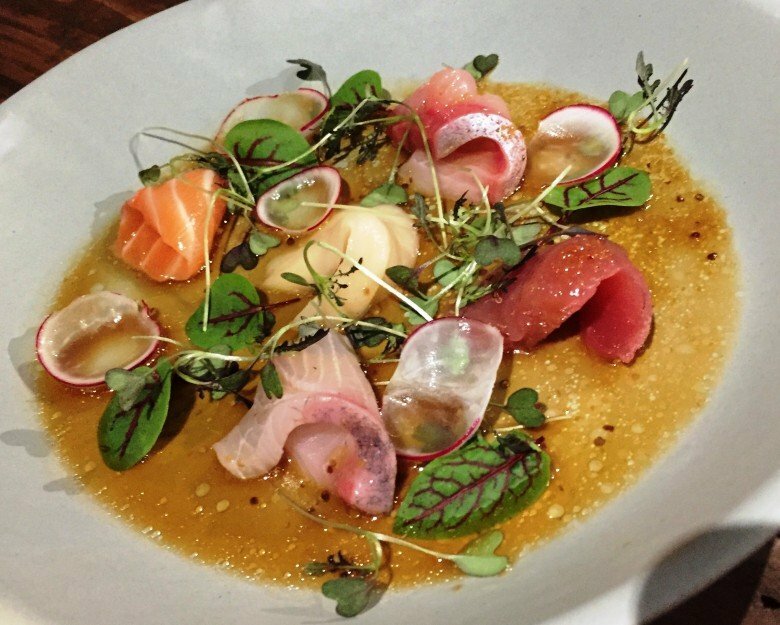 Thankfully Chef Mike has doubled-down in the Triangle, opening up M Sushi out in Durham. By happenstance I was in the area and popped in for an impromptu meal at M Sushi and you can color me impressed! 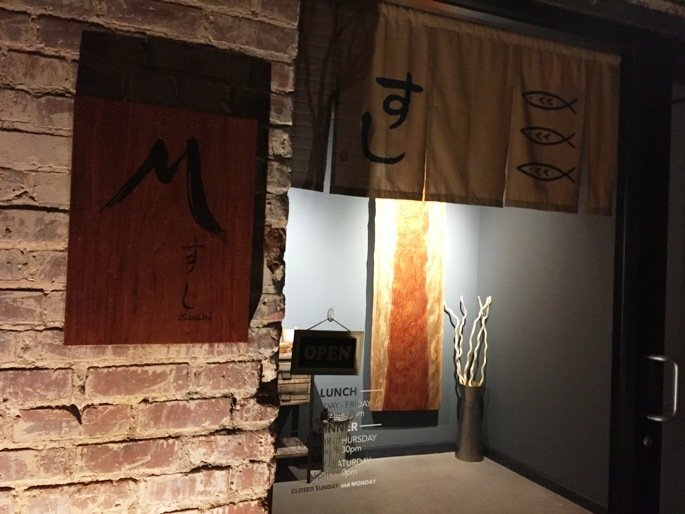 M Sushi is located in a quiet area of E. Chapel Hill Street with a side-entrance that’s not obvious from the street front. 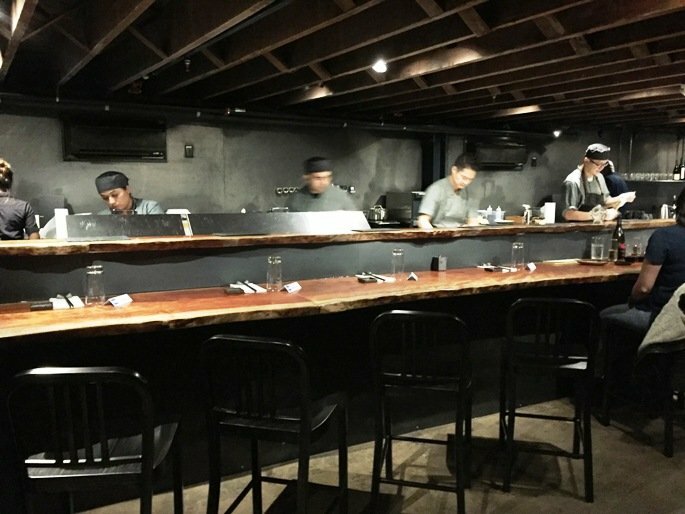 Inside, the space is long and narrow with a sushi bar to the right and seating around the edges to the left. 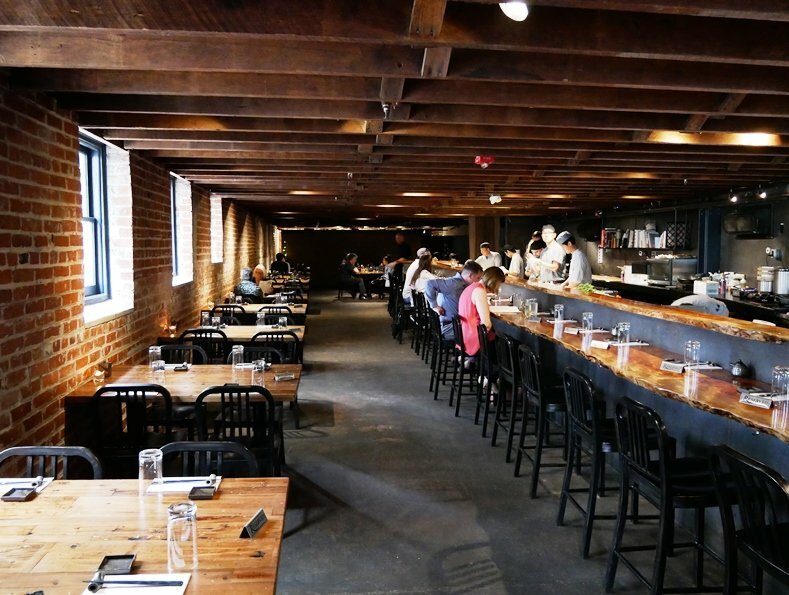 The exposed beams overhead and brickwork give the restaurant a rustic and minimalist feel to the dining room. The sushi bar is busy with 4 – 5 chefs including Chef Mike working hard to feed the busy crowd on a Wednesday night. The restaurant is pretty full even though M Sushi has only been open a week, a very good sign. We get lucky after a short wait and are seated at a 4-top on the side. Scanning the M Sushi menu, it looks short, simple but also interesting. The sushi options look somewhat traditional but with a slightly modern spin. I order up some steamed buns, the unagi maki role (eel) and a spider roll (salmon/tuna/soft-shell crab) for my meal while my friends try the light omakase (chef’s choice) and some other rolls. With some warm sake to keep me company while I wait, I scan the room and it’s an eclectic and more mature crowd. And I have to believe there are some serious foodies here given how new M Sushi is! 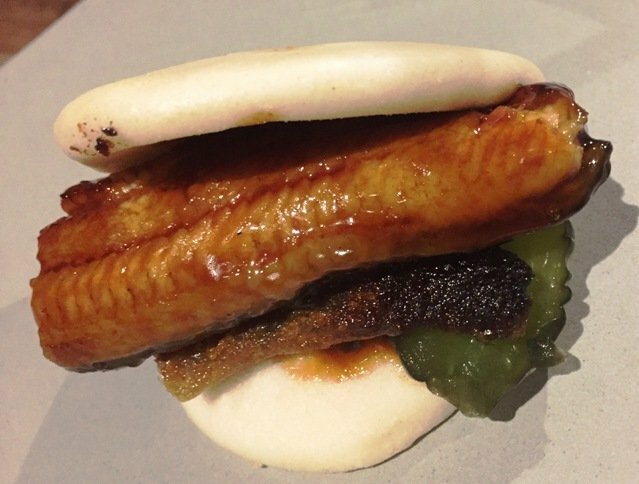 Our buns arrive first and you’re not going to believe it but it’s an “eel bun”, seared unagi with crisp salmon skin, hoisin and a pickle. Usually this type of steamed bun is done with pork belly but this version with the eel is fantastico! The eel is meaty, rich and dense and the crispy skin and soft bun play off of each other. Really good stuff, I would have liked a bit more tang in the pickle but it was great as is. Next up is my unagi/eel roll with a soy glaze in 6 large pieces. It’s a beautiful cross-section of delicious fish, rice and fun. 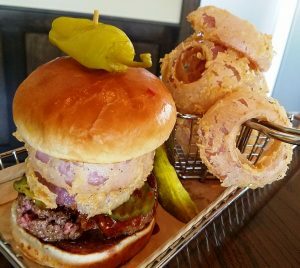 The slices are large but it’s well-rolled and holds together for a large mouthful of subtle flavors and great texture. My final roll is the spider roll which comes with what seems like a whole fried soft shell crab crawling out of the roll. 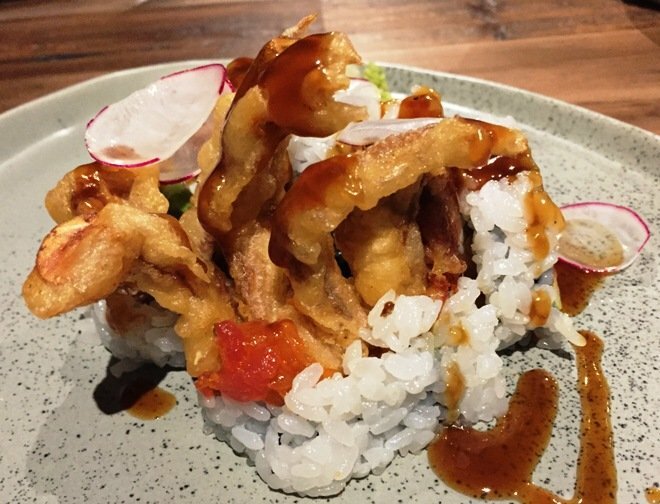 With some radish slices for decor, it’s a delicious hit of fried crab and fresh fish against the soft, supple sushi rice. Nicely done again! As the meal continues, I enjoy the burst of colors coming from my table-mate’s omakase dishes. 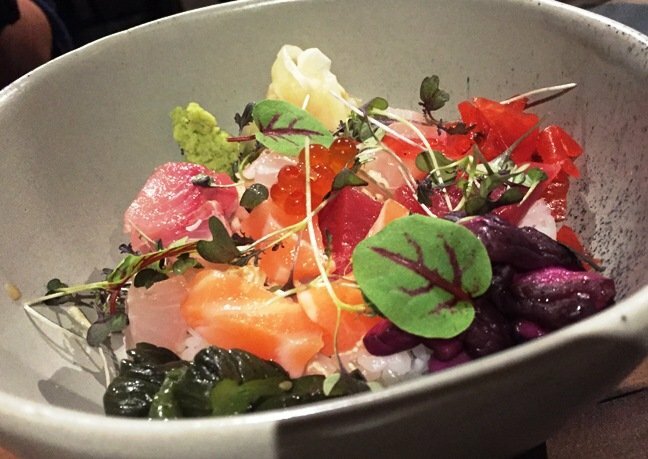 A bright crudo in broth along with a beautiful chirashi in a bowl. Chef Mike is about blending textures and taste in a more subtle fashion for the palate but let’s loose with the colors in his presentation. Service throughout the meal was good but I suspect it will get even better as the operations for M Sushi gets locked down with time and experience. I really enjoyed my meal at M Sushi and while it’s VERY different from its sister restaurant in Raleigh, I think it may be even better. More muted in its decor, smaller more traditional menu but everything here feels very respectful to the fish and dining experience. And I’m pretty sure if you like sushi you’ll love what Chef Mike has in store for you. Durham, you are pretty lucky to have M Sushi in town since we’ve been enjoying Chef Mike’s cuisine out in Raleigh for years. You might need a reservation, you might have to wait but make sure you give the newest and hottest sushi spot in Triangle a try as soon as you can!